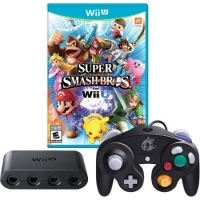 Description: This bundle includes the game, GameCube Controller Adapter for Wii U, and a special edition GameCube Controller emblazoned with the iconic Super Smash Bros. insignia. 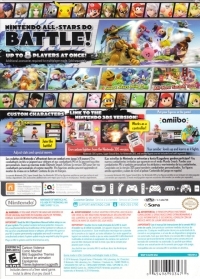 Box Text: NINTENDO ALL-STARS DO BATTLE! UP TO 8 PLAYERS AT ONCE! Adjust stats and special moves. Use custom fighters from the NIntendo 3DS version. Put your figures in the game! 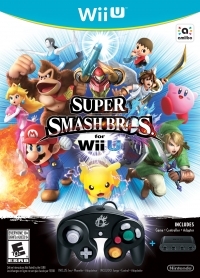 10-07-2014 badATchaos Description This bundle includes the game, GameCube Controller Adapter for Wii U, and a special edition GameCube Controller emblazoned with the iconic Super Smash Bros. insignia. This is a list of VGCollect users who have Super Smash Bros. for Wii U (Includes Game • Controller • Adaptor) in their Collection. This is a list of VGCollect users who have Super Smash Bros. for Wii U (Includes Game • Controller • Adaptor) in their Sell List. This is a list of VGCollect users who have Super Smash Bros. for Wii U (Includes Game • Controller • Adaptor) in their Wish List.